If you are in immediate danger, you should call 911. Stalking is the term used to describe repeated harassing or threatening behavior toward another person. 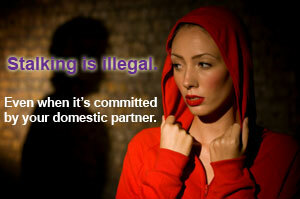 Although a stalker is oftentimes a stranger, he/she can also be a domestic partner. In California, stalking is generally considered to be any unwanted contact between a stalker and his/her victim that directly or indirectly communicates a threat or places the victim in fear. Anyone can be a victim of stalking. Does your partner always seem to be just around the corner when you are going to work, out with friends, or in your neighborhood? Does your partner keep making unwanted phone calls to you at home or work? Do you find signs that your partner has been in or near your home, your car, or your workplace when you weren’t there? Are you receiving repeated letters, faxes, gifts, and/or emails even though you told your partner or ex-partner to stop sending them? Has your partner tried to get information about you from a third person like a family member, friend, or co-worker? Many people think that stalking only happens to celebrities or between strangers. Stalking is a crime that can happen to anyone. If these experiences are part of your life, you are not alone and help is available in your community. A domestic partner who is stalking you can interrupt your life at home, at work and at school, affecting your relationships with friends, family and coworkers. You may feel afraid for your life, that you have no privacy, and that you have nowhere to turn because your stalker seems to always be there.